On Sunday (15 July), The Royal International Air Tattoo hosted Flying Scholarships for Disabled People (FSDP)'s annual awards ceremony, where graduates were presented with their scholarship certificates. Two of the graduates included Susan Couchman and Kathryn Hughes, who have been able to take to the skies, thanks to the support of a grant from The RAF Charitable Trust. Both received their scholarships in March 2018 after attending the Selection Board at RAF Cranwell in Lincolnshire and are currently in the midst of their training. The scholarships, which cost £12,000 each, pay for up to four weeks' aviation training at flying schools across the UK and up to 21 hours' flying tuition in either a PA-28 or a Microlight aircraft and associated ground school. Kathryn said: "My life has completely changed. I never thought I would be able to get in an airplane, let alone fly and then this happened. "The whole journey has made me very emotional and I have cried many times but now, I cry with happiness.Winning the scholarship from the RAF Charitable Trust has created magic and has given me confidence to lead a different life." Susan said: "My daughter is an RAF engineer and originally saw this scholarship, thinking that it would be good for one of my friends. I looked through it and decided to give it a go. I never thought in a million years that I would be chosen. "When my name was called at Cranwell, I was shocked but really excited. I feel that I am achieving so much and the FSDP has given me a whole new set of amazing friends. 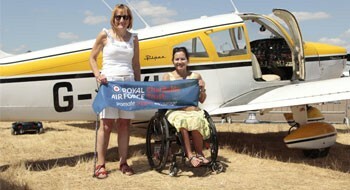 I cannot thank the RAF Charitable Trust enough for their kind support. It is changing my life." FSDP was founded in memory of Group Captain Sir Douglas Bader - the legendary WW2 flying ace who lost both legs in an air accident but persisted, and succeeded, in his efforts to resume his flying career with the RAF. Andrew Smart, an FSDP trustee, said: "As you can see, we look to change lives. Susan and Kathryn are proof of that and it is something we will continue to do." The charity supports scholars with a range of disabilities and illnesses and has helped more than 400 men and women experience the freedom of the air, learn new skills and regain their confidence. Susan and Kathryn will be welcomed to return to the Air Tattoo next year (19-21 July 2019), where they will be awarded their 'pilot's wings'.